In the previous four blogs on Discovering Your Unique Purpose, we have seen how discovering your unique set of Talents and Strengths combined with discovering your unique Central Core Motivations releases a new and powerful Passion in your life. Then, when you discover how your Strengths and Core Motivations align with what the world needs and longs for, you identify your unique Mission in life. When these three come into alignment with your passion and mission, you experience new meaning and fulfillment in your life. 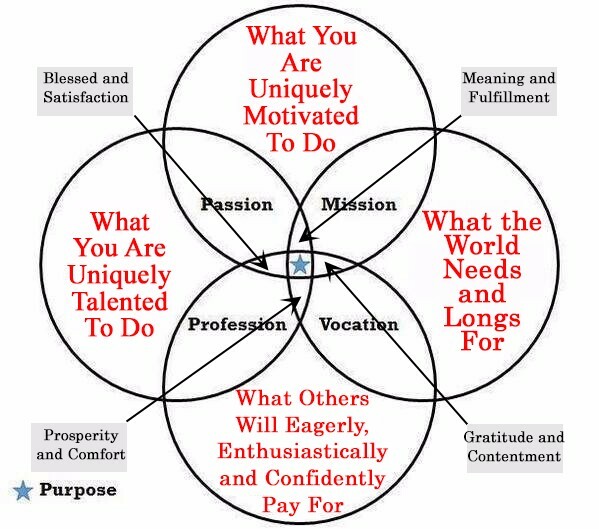 When your unique Talents and Strengths, combined with your unique Central Core Motivations, align with “what the world needs and longs for” you then connect with what people will eagerly, enthusiastically and confidently pay for. With this addition, you discover you true Vocation in life producing a deep gratitude and contentment. 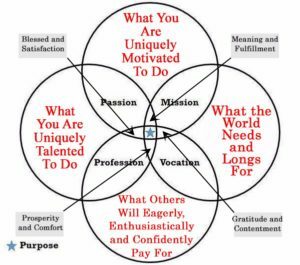 The two new concepts we need to add are the results of combining our Vocation and our Profession. This combination produces Prosperity and Comfort. And, because we are deeply grateful and content, we also become much more generous and find many new opportunities to give both in time and in finances. Then, when we combine our profession and passion we realize how Blessed we truly are and experience a deep Satisfaction in all that do in our lives. All combined, this information then identifies our unique purpose, our Opus Gloria, defined as our ultimate contribution in life. This is what it means to live life on purpose, to change the world for the better through our unique contribution. From my book The Language of Blessing, “What you have to offer the world is so rare that it has never been given before and it will never be given again.” Have you experienced the joy of contributing authentically from who you are for the benefit of others? This is what we are each on planet earth for, to know that great joy as we bless one another. This realization can all seem very overwhelming. So, many of those that I have coached over the past 25 years have not believed that they are uniquely talented. They have actually said, “Anything I can do, I know there are others that could do it better.” Maybe you have thought the same thing. I do understand why they believe this to be true. So much of their lives they have tried to be what others have said they should be, and they may have become quite competent in doing just that. But it has cost them dearly, resulting in losing their sense of who they truly are, their authentic selves. This is a cost no one can afford. At Equip 2 Equip LLC, there is nothing we enjoy more than helping someone rediscover their authentic self, their incredible talents, powerful motivations, their innate character and their unique Life Purpose. Hello, I am a mental health therapist with my own practice. I am interested in adding Life Coaching to my practice. I would like some information on upcoming Coaches training you might offer. I also have heard all good coaches have experienced coaching and have a coach, so I would be interested in talking with someone about that. Thank you.